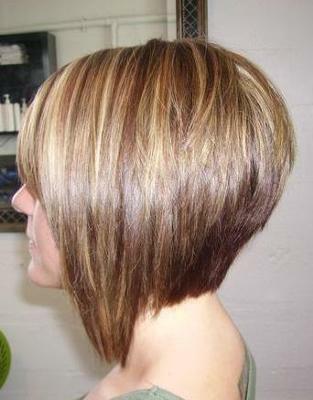 Its a nice bob layered hair cut with asymmetric style, longer on front side and shorter on back of neck. Base colour is medium brown, highlighted with medium blond streaks. I love this hair style i had my hair cut like this a year ago and get it trimmed every month or two. Nice bob cut indeed. I really like it and the color combinations are so beautiful. Thanks for sharing this Amy.